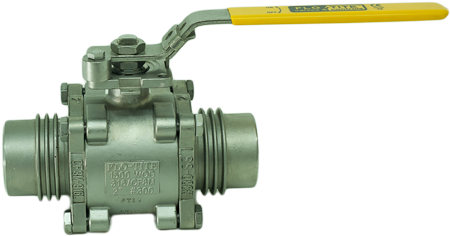 Historically, weld-end ball valves presented challenges to users in process control applications because of the high temperatures during the weld, which would damage the temperature sensitive parts of the valve (seals and seats). One work-around is to extend the piping to the valves ends, but this adds cost and time. Another solution is to dis-assemble the valves and remove the seals and seats prior to welding. Then, after welding, re-assembling the valve when the valve after everything has cooled down. This is much more complicated, takes more time and can be very problematic if the valve is part of an automated package. A unique approach for socket weld and three piece valves, pioneered by valve manufacturer Flow-Tite, that uses integrated extended end-caps with heat sink rings. The design provides much more surface area, thus allowing the heat to dissipate during welding. Any heat conducted to the seat area does not have a high enough temperature to damage the valve seating or sealing material. With this novel and common sense approach approach, soft-seated, three-piece ball valves that were once a problem to weld, can now be welded in-place without disassembly, extended time and related costs.